anyone else using just Bass and snare? Anyone else using a set up like this? I used this set up for years and loved it. Recently I have added a floor tom and some more cymbals. I think you will find your playing and creativity reaching a whole new level. Yes! I occasionally strip down my Rogers Parklane cocktail outfit into an Astoria. the Astoria only has the snare and 16" FT used as the bass. (Parklane has a 12" or 13" mounted tom in addition) In one two-week venue I play in the summer, I don't even use cymbals or hihat. Brushes only, and a noisemaker or three for effect--Vibra-Slap, woodblock, cowbell. I also use an egg shaker with a handle in my right hand that allows me to play simultaneously with the brush, too. I've found that there's lots of available work for a trap-set percussionist who is willing to play sparsely and quietly to acoustic roots music, which seems to be all the rage now. The old Rogers cocktail outfits are perfect for this. I gigged on a 2-piece (Bikini) set from 1999 to 2006. I used that set-up exclusively for over 2 years with one of my old bands in Calgary. I loved it. It really forces you into a place of creativity. The C&W and folk stuff we did was not terribly demanding, and the smaller configuration lent itself readily to those genres (even rockabilly). The few times that I was thrown a solo were the most challenging, but in a good way. Along with some brushes and hot rods. Nice and simple, and it makes you have to think more creativity for fills. I have used the bikini kit with rehearsals in a big band .... travel and load in accounted for that. But during Fall I use my Slingerland Jam Session sans rack tom and FT and supplement aux percussion such as bells and chimes and hand percussion for the low brass ensemble I play with. Have also done it as some blues jam where I've been with the house band. Really I just did it then to screw with some of the wannbe drummers who would show up. I started using this setup because i was getting bored of basicly having to overplay. I found i was putting "Kewl drum parts" in where a simple beat would work and i want to get my basics all simple again. It is awesome thinking up new ways to play songs that i have always used a full kit for. glad to see so many of You are using the "bikini" kit. Played several gigs with: Kick, snare, 18" K crash / ride and 14" K beats. 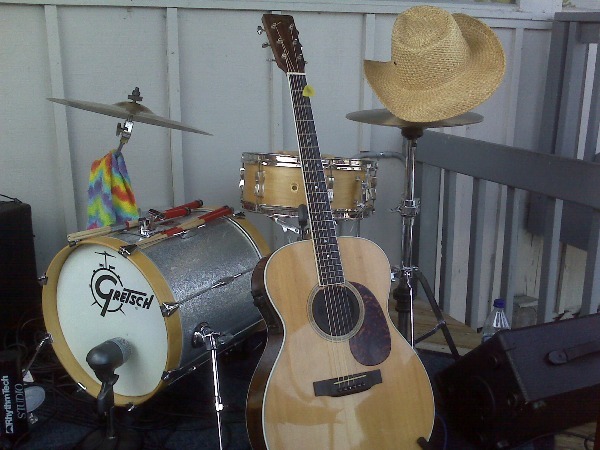 I played several Christmas parties a couple of years ago with a solo acoustic guy and used a snare and a set of closed 10" special recording hats. Most every song used brushes or blastix. Very strange gig. The guy got $375.00 for the two hours and gave me $150.00 of the pay. We did this gig 3 times. On the last gig I took the bass drum and hh stand but he did not want me to use it. When I'm traveling light I'll gig with just the three piece kit. It's great for drummers to check this out every now and then. I'll be doing a clinic about this very subject at this years Chicago show. Not generally. But for a one-off jump blues gig two months ago I forgot to bring the SOM tom arm for the Sling kit I was using, so I played the gig with snare, BD, FT, two rides and hats. It looked cool (the whole gig had a retro vibe) but I missed the 12" tom. Then for a couple of the small-room VA gigs my jazz quintet played over December I cut back to snare, BD and cymbals. I missed the toms less this time, because 75% of the time was backing singers doing Christmas ballads. But on the instrumental features I found I still really like having toms for tonal color, especially on solos. I tend to play melodically as much as rhythmically and it turns out different voices are more important than I would have thought. Getting back to basics and concentrating on groove, rhythm and rudiments are great, but I guess for me the four piece is basic enough. I like the 3 pc thing as well... The "one of each" concept, with a bass, snare and tom. Thebikini thing is a bit too minimal for me... I like that rack tom. That being said though I use the 3 pc kit a lot and don't ever really miss the floor tom. I started with it because i didn't really like setting up and positioning this hanging floor tom that I use with the kit... so I just stopped bringing it along! Haven't missed it though really, for the kid of music that I do with it (small group jazz). One day though I will put legs on that floor tom... but I might not be using it all that much... The 3pc just works for me. - as part of a percussion trio with two hand drummers. If you've got one guy on congas and another on djembe, what the hell do you need a bunch of tom toms for? I like a bikini set for some small acoustic gigs I pick up from time to time. Talk about minimalist? I love this setup. So does the cat that hires me. Clean, EASY to set up and break down, and it keeps me from wanking on acoustic duo gigs. If their bass player shows up and we're going as 4pc, I'll add the 8x10 rack and 13x13 floor, and fly a 12" splash. But just two acoustics - it's the 2 pc version. Eventually, I want a 5x10 popcorn snare w/a suspension mount and another tom mounting arm mounted on the kick so I don't have to carry a snare stand. Might as well go all the way and reduce your kit until you're just stompin' yer feet and slappin' yer thighs. That's a gorgeous set! Homemade kick? Actually, that's a factory Gretsch job. It's part of a 6x8, 8x10, 13x13 (floor) 16x16 (kick) Catalina Elite Jazz setup - the ones they discontinued and then went to the two piece lugs that are currently offered. I've seen lots of these kits in 12/14/18 configurations, never have seen another 8/10/13/16.